In early 2005, the head of the Drikung Kagyu School, H.H. Drigung Chetsang Rinpoche contacted H.H. Shamar Rinpoche while he was conducting teachings on the Sutra of Alankara in Hong Kong. Drigung Chetsang Rinpoche informed Shamar Rinpoche that in early 2004, he had a meeting with H.H. Orgyen Trinley Rinpoche in Bodh Gaya, India. Drigung Chetsang Rinpoche told Shamar Rinpoche that during their meeting, Orgyen Trinley Rinpoche had expressed respect for Shamar Rinpoche’s important position as a lineage holder. Orgyen Trinley Rinpoche also said that he was willing to pacify the longstanding Karmapa controversy and asked Drigung Chetsang Rinpoche if he could arrange a meeting between himself and Shamar Rinpoche. Shamar Rinpoche told Drigung Chetsang Rinpoche that he would give his response once he returned to India. In February 2005, Shamar Rinpoche contacted Drigung Chetsang Rinpoche in Lumbini and informed him that due to obstacles caused by some ambitious politicians, a meeting was currently quite difficult to arrange. However, Shamar Rinpoche added, when the time was right he would let Drigung Chetsang Rinpoche know the best way to proceed. Later, in early 2005, Shamar Rinpoche sent a message to Drigung Chetsang Rinpoche saying that restrictions on Orgyen Trinley Rinpoche had been greatly relaxed. According to his understanding, if the troublemakers around Orgyen Trinley Rinpoche did not make further mistakes, restrictions would soon relax even more. 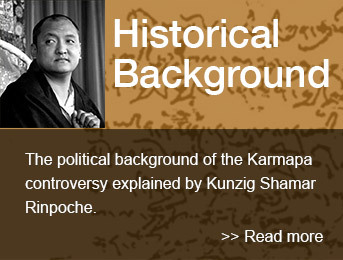 Shamar Rinpoche said he would advise H.H. Karmapa Thaye Dorje to talk directly to Drigung Chetsang Rinpoche. Trinley Thaye Dorje is now twenty-three years of age and the Karma Kagyu is fully under his administration. The only exception is the famous Seat of Rumtek case, which is being handled by the Trustees of the Karmapa Charitable Trust who are the plaintiffs. Therefore, Shamar Rinpoche asked Drigung Chetsang Rinpoche to present Thaye Dorje the peace proposal between the two Karmapas. Shamar Rinpoche met Karmapa Thaye Dorje and the council and informed us that Drigung Chetsang Rinpoche had voluntarily offered to mediate a solution to the conflict. Shamar Rinpoche suggested that we should cooperate with Drigung Chetsang Rinpoche since he is one of the principal Kagyu leaders and that out of respect; his proposal should not be ignored. Shamar Rinpoche added that Orgyen Trinley’s proposal for peace was like a lotus, which blooms from mud without being stained by it. Therefore, he said, that unless the situation turns negative, the council of Karmapa should show its respect towards Orgyen Trinley Rinpoche, since he is a highly placed spiritual leader, recognized by both the Government of China and H.H.Dalai Lama. In early 2006, the committee received a message from Drigung Chetsang Rinpoche saying that he would like to visit Karmapa Thaye Dorje in May. Accordingly, H.H. Thaye Dorje told his administrators that since Drigung Chetsang Rinpoche was voluntarily offering to negotiate peace, the council should discuss the best way to co-operate with him. The council held a number of meetings and heard opinions from the late Karmapa’s senior attendants. It was decided that we should lend our co-operation only to Orgyen Trinley Rinpoche and the personal attendants who left Tibet with him. We also agreed to request that H.H. Drigung Chetsang Rinpoche act as mediator. In addition, we agreed to invite the Tibetan Exile Government to participate in the negotiation process whenever the time becomes appropriate. However, we resolved that we could not negotiate with any of the Rinpoche’s who surround Orgyen Trinley Rinpoche. There are two reasons for this: firstly, these people misused Orgyen Trinley Rinpoche for their own benefit. Secondly, they are from entirely different labrangs (administrations) and since the beginning, never had any right to involve themselves in Karmapa’s labrang. We also determined that no co-operation was possible with the people who violated the faculties of Rumtek’s administration and undermined the wishes of the late Karmapa by betraying Rumtek Monastery for their personal interests. With this in mind, we settled on the proposal that a negotiating committee be formed from members of the late Sixteenth Karmapa’s genuine administration. We decided we would only accept representatives on Orgyen Trinley Rinpoche’s side, from among the people who originally left Tibet with him. We proposed that the committees meet together to discuss all issues until they reached an agreement that represents a clear solution. Following this, Thaye Dorje and Orgyen Trinley Rinpoche should meet to finalize the peace agreement. We offered this proposal to Trinley Thaye Dorje, and he readily agreed, saying that he would happily follow our suggestions. We asked His Holiness to discuss the proposal with Shamar Rinpoche since he is his senior, to which he agreed adding that he was sure Shamar Rinpoche would give it his support. A few days later, council members received a congratulatory phone call from Shamar Rinpoche, who was in the United States . A month and a half later Drigung Chetsang Rinpoche arrived in Kalimpong for a personal meeting with Thaye Dorje. Drigung Chetsang Rinpoche told Thaye Dorje about his meeting with Urgyen Trinley Rinpoche and how he had expressed a strong interest in bringing about peace within the Kagyu School . Drigung Chetsang Rinpoche said he hoped a telephone dialogue could take place between Thaye Dorje and Orgyen Trinley Rinpoche. Thaye Dorje then explained the proposal already put forward by members of his administration. Drigung Chetsang Rinpoche expressed his happiness about the proposal and praised the spirit of co-operation H.H. Thaye Dorje’s people had shown. He said that he would begin the negotiation process immediately. Just two hours after he returned home from his meeting with Thaye Dorje, Drigung Chetsang Rinpoche received a visit from Orgyen Trinley Rinpoche’s general secretary, Drupon Trulku. Drigung Chetsang Rinpoche explained the proposal from Thaye Dorje’s side. The council received word from a reliable source detailing Drupon Trulku’s response. The moment Drigung Chetsang Rinpoche informed Drupon of the proposal for committees to be formed – he became enraged. Drupon immediately rejected the proposal, saying that such a method of negotiating was utterly unacceptable, and he left immediately. We have analyzed why the rejection occurred. Evidently, when it was mentioned that only people who had accompanied Orgyen Trinley out of Tibet were to be included in negotiations, Drupon assumed this meant that he and his side-people would be excluded. Secondly, we believe that by having negotiations conducted through knowledgeable people, Orgyen Trinley Rinpoche would receive detailed information about how he has been used and misled by those around him. Given Drupon’s response, we concluded that his own people are still misleading Orgyen Trinley Rinpoche. They continue to make his decisions for him, while serving only their own interests. The fact that Drupon rejected Drigung Chetsang Rinpoche’s proposal without first consulting Orgyen Trinley Rinpoche merely confirms this. In any regard, we are prevailing. If the so called General Secretary, Drupon Tulku chooses to negate the peace process, it will simply be their loss.